See You Next Week in Beautiful Denver! It’s Time for HuberCrete® Ground Calcium Carbonate to Shine at The Precast Show! 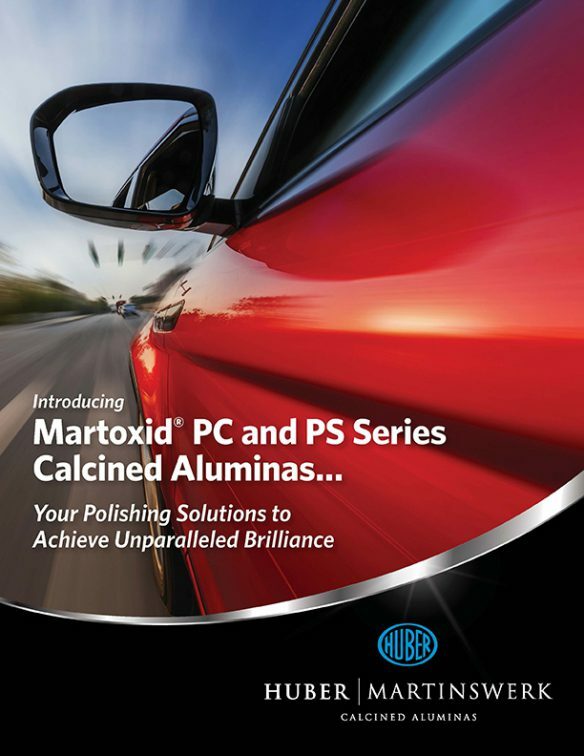 Huber offers a complete product line of Martoxid® PC and PS Series Calcined Aluminas designed for polishing, cleaning and lapping compounds. Click on the link below to download our product literature. We’re pleased to offer a variety of Martoxid® calcined aluminas to give polishes the ability to achieve their highest possible brilliance. In addition to polishing applications, our Martoxid products are ideal for cleaning and lapping compounds as well. We offer two exclusive Series of products: Martoxid® PC and Martoxid® PS calcined aluminas. The Martoxid PC Series products have high purity with narrower particle sizes while the Martoxid PS grades give the highest possible brilliance due to morphology and structure and offer the best combination of cutting effect and polishing, as they do not impart scratching. Each of our Martoxid® PC and PS Series grades offer the ideal combination of particle size distribution and accompanying physical properties to give the formulator a broad choice of grades to choose from that are applicable to their application. We invite you to peruse our literature by clicking here to download and contact us to order product samples.